Continuing Education Illinois requires 24 hours of related education every 2 years. Illinois requires that 2 of the 24 are Ethics. 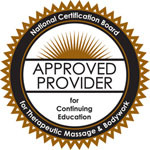 DVD Requirements Earn up to 12 hours of CE credit per renewal for completion of one of our self-study course that is sponsored by the NCBTMB. Each self-study course will include an examination. Earn up to 24 hours of CE credit with our hands-on courses. Find a location for an upcoming class near you.